Enforce the synchronization between the blue deforming Bones and the green animation Bones. The double sided arrow right to the Button sets the direction of the synchronization. Note: The snapping happens automatically when you switch from edit mode to pose mode. But it works only correct when you edit the green animation bones! Tell Avastar to calculate and store the control values for the appearance sliders after the Armature has been edited. 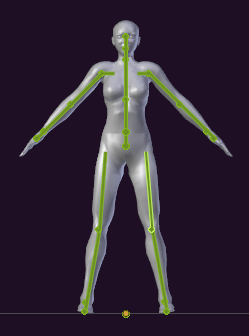 Important: We recommend that you edit only the green animation bones and let Avastar handle the blue/purple deform bones automatically! Revert the skeleton back to the SL default Skeleton. If the Snowflake icon is enabled, then the rig edits are kept (it is not reverted to T-Pose). Only the Joint edits as recorded by Avastar are removed in that case. 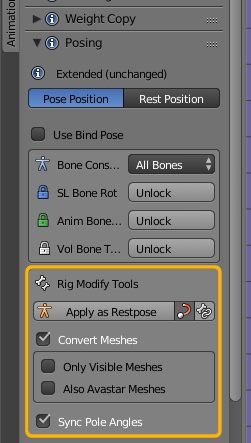 Bind poses work only without problems if they have been created from the original SL Rig by only rotating the bones. If the bones have been moved (translation) then we have to handle the rig in a different way (see further down). Please check with your development kit provider if they have only used bindposing or if they have actually edited the skeleton. It is very popular to use A-Pose rigs, that is where the arms are bended downwards into an A-Pose. And sometimes also the legs are bended a bit outwards (see image). for technicians: Blender does not support Bind poses. Therefore we must convert the original Bind pose (that was used by the mesh creator) into the new Avastar Restpose. And when we export the rig we must revert the conversion of the rig back into a T-Pose Rig. Avastar is ready to support all of this for you in the background. Select the Avastar Armature in Pose mode. 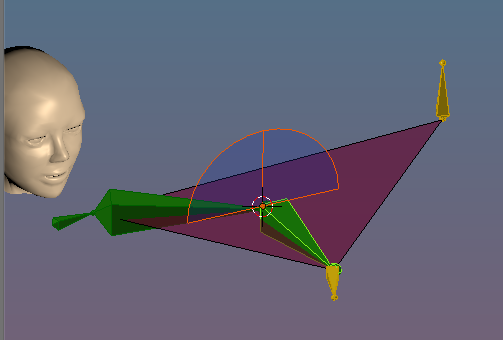 Then adjust the Avastar pose to the development kit mesh until the rig matches the Mesh as needed. 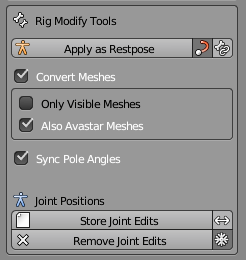 Since Avastar-2.3: The Convert Meshes option has previously been a white snowflake icon on the right side of the Apply as Restpose button (formerly named Convert to Bindpose). We have extended the functionality of the operator and moved the snowflake for better clarity into the next line and named it “Convert Meshes”. Strictly spoken only the Bone heads are important for the Rig. However in some cases, especially for the leaf bones (at the end of bone chains) you usually want to also record the bone tail information to make sure that the rig keeps the intended look. If you disable this option you may get unexpected results. Avastar tries to auto adjust the IK Rig. However this only works nicely when you work with human rigs. For other rigs the automatic adjustment might not work. 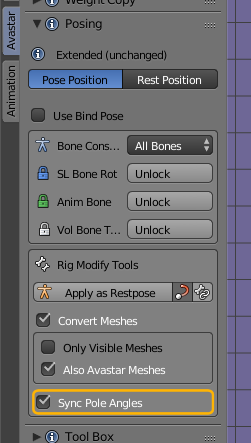 So you can try to adjust the IK Bones manually and then enable this option. This becomes very important when you are working with Fitted Mesh. 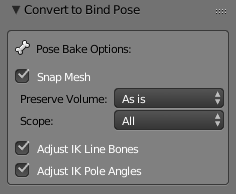 Note: When all you want to do is fitted Mesh for the system character, then please do not use the Convert to Bind Pose option! The most simple workflow for using this option was described further up in this document. When you call this Operator, then you will also get an Operator Redo Panel (at the Tool shelf Bottom) from where you can adjust the settings interactively. But take care here: The adjustments are not displayed immedately, especially when you have very complex high polygon meshes in your scene. In that case you may need to wait a few seconds before the display updates. Right after you have clicked on the Button an operator panel will show up at the bottom of the Tool Shelf (lower left corner). You might need to scroll down the Tool shelf to spot that panel. Scope: Selected Bones, Visible Bones, or All Bones. Pole Angles become important when you work with IK Targets. 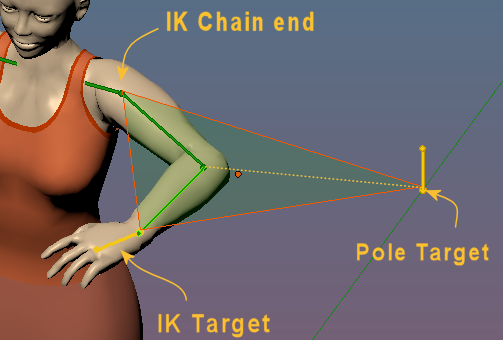 It is important to have the Pole angles adjusted correctly because otherwise you will see remarkable changes of your pose when you switch between FK and IK mode. Normally you want to keep this Option enabled. Imagine a triangle spanned by the three bones IKChainEnd, IKTarget and PoleTarget. In the left image below we have the Collar Bone (IK chain end), the Writ Bone (IK Target) and the Elbow Pole target. This triangle defines a plane in space. This pole plane is sketched as a transparent green triangle.